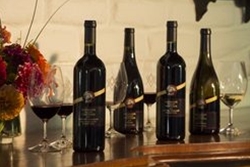 The Alexander School Reserve Club offers limited production wines that focus on some of the best and most unique lots of wine harvested each year. Winemaker Kevin Hall creates wines showcasing unique varietals, winemaking techniques and vineyard sites. These wines are small production, uniquely different and one of a kind. Shipments are sent in March and September. You are adding an Alexander School Reserve Club membership into your shopping cart. To finalize the purchase of this club you will be contacted by AVV via a phone call and/or email to confirm credit card billing information. You may also call Mike Fishback at 707-433-7209 with the information. Our webstore does not store the credit card information you enter at checkout. The club membership will not be active until Alexander Valley Vineyards has confirmed the billing information with you. Once activated you authorize Alexander Valley Vineyards to automatically charge your credit card for two annual shipments. Shipments average $200 plus tax and shipping. If you have any questions, please contact Wine Club Director: Mike Fishback 707-433-7209 x 117.